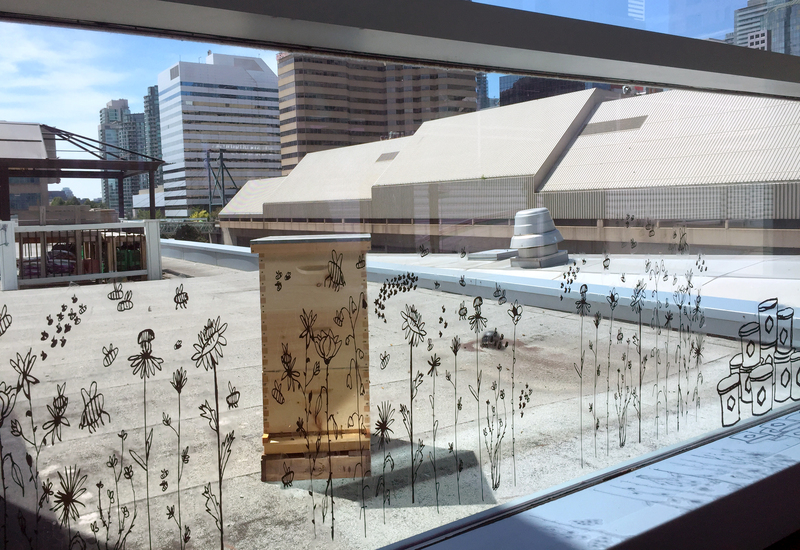 It’s with great pleasure that we introduce you all to the Metro Toronto Convention Centre’s newest residents: honey bees! Our four hives were installed in June and the bees will be hard at work all summer long pollinating nearby flowers and making delicious honey for our culinary team’s use. Plus, you can watch them as they busily buzz around at a close (and safe!) distance. The hives are located on the top of the South Building with lots of access to nearby parks and gardens, as well as a great view of the neighbourhood. This spot was chosen not only for maintenance ease or the proximity to plants, but also because of the great visibility for all our guests, clients and employees. One of the hives has been placed right next to the window so you can take a peek and watch the bees bringing in nectar and taking care of their home, all through the safety of a pane of glass. The other three are located on the other side of the roof top herb garden, and they can be seen as you walk across the Bridge between our two buildings. You can see one of our hives through a window on the south side of the bridge that connects our two buildings! We are very happy to be involved in the ever growing world of urban beekeeping. From producing local honey to garden pollination, to overall perennial greening, urban beekeeping provides many benefits to a city. With climate change, widespread use of pesticides, habitat loss, and new diseases and parasites, the world population of bees has been declining quite dramatically over the last several years. This trend is also quite alarming because of the major role bees play in fruit, vegetable, and nut production. About a third of what we eat relies on their pollination, so without them farmers are left feeling the effects strongly. But cities, contrary to what many believe, are a great place for bees! There are strict anti-pesticide laws, untapped floral diversity, and largely unused rooftop space. In conjunction with our new bees, we have also changed our landscaping plan. This year, we planted a garden to specifically support bees, butterflies, and other local pollinators. They are also mostly plants local to southern Ontario, meaning we are able to save water while helping to preserve pollinators essential for the natural environment. Bees are very resourceful at finding nectar and pollen for the hive. They travel far and wide to find a harvest – anywhere within 5 km of their hive! By the end of the season, an urban hive will have made about 10 kg of honey. Since each bee will only make about an eighth of a teaspoon of honey in its 30-day life, it means a hive will have one big work force. In fact, a hive has approximately 50,000 bees. There’s only one queen, though. She’s hard at work laying about 2,000 eggs every day. And the worker bees are always on the go too. Whether they are cleaning the hive, taking care of the queen, guarding the entrance from intruders, or out finding resources, worker bees are as busy as, well, bees! It’s important to note that honey bees are not aggressive by nature. Unlike wasps, honey bees die after they sting you so they have zero incentive to do so unless they are under attack. Plus bees are vegan! It’s the wasps that are the carnivorous little beasts that bother you so much. The hives will be managed by a company called Alvéole. They also have hives on the roofs of the Shangri-La Hotel, the CBC building, and the Power Plant Theatre at Harbourfront. So, the next time you’re in our building, stop by our Bridge on the south side and have a look at our busy new residents! Wow! I’m impressed and inspired. Thank you for helping to save the bees and providing an incredible and invaluable educational experience for viewers and bringing us back to nature. We need more of this! Thank you! It’s an exciting development and we are happy to spread the word! Looks great, wish we had more of these in the major cities in Australia. There’s only a few here in Melbourne but all in regional areas away from the main city. Thank you for the kind words Bec! We are estimating that we were able to produce 300-400 jars of honey this year. All the best!